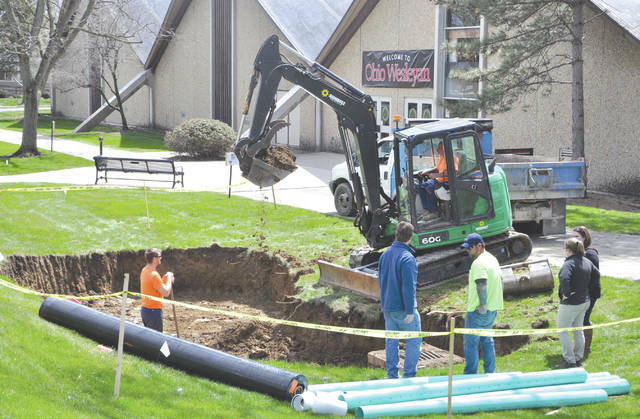 Crews work Monday on removing land to create space for a spring garden to be located just outside the main doors to Branch Rickey Arena on the Ohio Wesleyan University campus. More than April showers are responsible for the flowers that soon will beautify the path to Ohio Wesleyan University’s Branch Rickey Arena. New 30-foot-by-15-foot rain gardens are currently being installed on each side of the north steps leading to the athletics facility. The project is a collaborative effort involving OWU students and faculty, City of Delaware employees, and even an Ohio State University graduate student. The rain gardens were proposed by Janelle Valdinger, a public utilities GIS technician for the city and an OWU student in professor John Krygier’s environmental geography course. “Our community, and the surrounding environment, are ours to protect,” said Valdinger, a junior geography major who has worked full-time for the city for about a year. “These bio-retention cells are living examples of best management practices for stormwater management. “This implementation allows us to prevent, and reduce, pollution from nonpoint sources,” added Valdinger, who has helped to secure $7,500 in city stormwater funds to cover the cost of creating the environmentally friendly gardens. The rain gardens will be located around stormwater drains that follow the bed of a now-buried stream that empties into the Olentangy River. The gardens will be filled with colorful flowers including pink phlox, blue flag irises, yellow black-eyed Susans, red cardinal flowers and orange butterfly milkweeds. The flowers were selected with oversight from Caroline Cicerchi, Delaware’s sustainability and watershed coordinator, and input from OWU freshman Dustin Braden, a double-major in environmental studies and communication who previously worked with the U.S. Fish and Wildlife Service to help convert land in his hometown of Granville, Ohio, into a public nature preserve. Braden said he and Cicerchi chose plants that “would be effective and beautiful, as well as great habitat for pollinators and other native Ohio species.” They also selected plants with differing bloom cycles so that the rain gardens provide splashes of vibrant color from late April to early November. Not only will the gardens be eye-catching, said Krygier, Ph.D., OWU’s director of environmental studies, but they also will help to improve the environment. Krygier said he and his students are grateful for the collaboration of so many people in planning and installing Ohio Wesleyan’s first rain gardens, including the City of Delaware, the university’s building and grounds staff, botany and microbiology professors Laurie Anderson and David Johnson, and Jonathan Stechschulte, an OSU master’s student in landscape architecture who created hand-drawn renderings of the gardens. Krygier said he looks forward to similar collaborations in the future.